Lina, an ambitious young woman, leaves her husband and son in China to go to Paris to build a brighter future for them. But once in Europe nothing happens as planned and she locks herself into a world of lies so as not to give up on her dream. Graduate in Film and Radio production at the Institute of Broadcasting Arts (IAD – Belgium, 2000), Olivier Meys quickly left to work in China. He witnesses the important social changes experienced by this country in recent years and produces many award-winning radio documentaries (Radio Grand Prize SCAM 2007, Nagra Grand Prize of Creation at the Brest Longueur d’onde Festival 2010). Olivier Meys has also directed short films and documentary films, including “Vies nouvelles”, First Film Prize at the Traces de Vies festival (2005) and “Qian men Qian”, International Prize of the SCAM “Cinéma du réel” 2008. 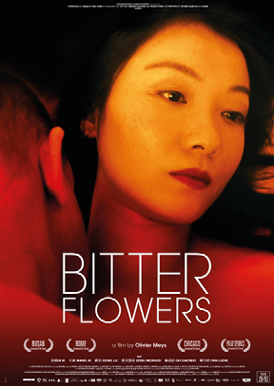 “Bitter Flowers” is his first feature film.